Come on green/white cat Lord! Bastet is the Cat Goddess. But is she green/white (or even Naya)? From my limited knowledge I would think that was possible. She was a goddess of warfare, but she apparently sort of morphed into a protector goddess later on. There is another goddess called Sekhmet who was cat like and remained a war goddess. So, could be WG but I wouldn’t be shocked by WR. That said it could equally be all kinds of other colour combos. Whatwhatwhatwhat. VRASKA! Kitty headed god-thing! BOLAS! Atlantis or Aztec type world it seems. Sooooo… Altlazan is the set after HoD….? and it looks like its Atlantis based…? and then Ajanis gonna be there…? yeah, everyone knows cats hate water, wtf? Just from the names and styles, it would seem to be a blending of Mesoamerican culture, with possibly a fantasized Atlantis feel? The name and Merman are all that provide the Atlantis part; the name itself could be derived from Aztec or Mayan language influences (it reminds me of a few locations, etc). Also, Bolas is on HoD, so I assume he’ll be held until that set? gods and plains walkers. my body is ready. So since Bolas is on the HoD packaging I guess we wont be getting him in Amonkhet. That’s a bit disappointing. I wish I knew what people mean when they say an Atlantis-like plane, when we barely know anything about that ancient civilization, let alone if it really existed. Not a single archeologist would acknowledge it, so why are people saying Atlantis-like? SMH. I assume they mean ocean-themed underwater civilization. I guess they mean an island with an advanced society on it that is threatened by some manner or rising sea level. I’m an archaeologist and while I am of course not going to acknowledge the existence of Atlantis I feel like the myth is well enough know for something to be fairly called Atlantis like. Looks like a very hasty cover up lol. That doesn’t really mean anything. We still now know the names “Atlazan” and “Conquest of Power”, plus we have two pieces of art from each set. Aztlán (from Nahuatl: Aztlān, [ˈast͡ɬaːn]) is the legendary ancestral home of the Aztec peoples. 1. Bolas looks like a badass. 2. I didn’t realize how much I needed the Egyptian motif. 3. I thought about an Atlantean/Aquatic theme in the past, but then I thought to myself “A theme were blue is obviously the most prominent or powerful? They wouldn’t do that, that will end poorly” Oh god, I wonder how they’re going to screw up a “fixed” ancestral recall this time. I need an Atlantean Oceanic plane in my life. I don’t think Atlazan will be Atlantis. Oooooooooh, Vraska. Or someone who looks much like her. Pronouncing Atlazan’s Atl without making it Alt is going to get me so many times. Seems like Merfolk will come back in Atlazan. Maybe some new legacy staples will come with it. Hoping for good things with a new Vraska. So Ajani in Conquest of Power then? I wonder if he’s about to join the Gatewatch. I’m just glad of the essential conformation that he isn’t about to die in Amonkhet, I could feel that coming and I didn’t like it one bit. Im pretty sure the tentacle hair person is Vraska from Ravnica but I agree she definitely fits. Atlantis is an uninteresting myth and is more Greek than anything. It’s kinda in the theros lore isn’t it? I think the merfolk partner commander claims to have found it. Yup. Forget the name, but it’s attached to a giant kraken, I believe. Didn’t even think about it until now, but Atlazan also sounds like Amazon. Wouldn’t a jungle theme also make more sense if it’s related to Central/South American cultures? If you ask me, I think more about Coatl, Giorgio Tsoukalos (ancient alien astronauts) ;-), human sacrifices, etc. Oh god, Ugin is the Giorgio of magic. Ancient Eldrazi Astronauts. I have a theory… if Atlazan is a Atlantis/Pre-Hispanic plane, the Future Sight card Graven Cairns shows a colossal head (like the Olmec colossal heads), there’s also a sculpture in the middle of the artwork that looks like a “native” american (actually looks like the guy from Apocalypto). Just google image: “Graven Cairn mtg” to find the artwork I’m talking about. I would like to know more about the shamans of Kar-Sengir. You realize part of the origin of Kar-Sengir is Sengir, right? Like…Homelands house of vampires led by Baron Sengir? This excites and confuses me, assuming your connection is correct. Sengir vampire colonies. Sweet hell. Yes my friend. I know about the portal under castle Sengir, Homelands was the “New Freedom” for the Dwarves who came from another plane. And Wizards never finished that story. Of course my words are not an affirmation, as I said a theory, but I would like to think that there is minimum chance. I would love that. Maybe an RB vampire planeswalker with it. 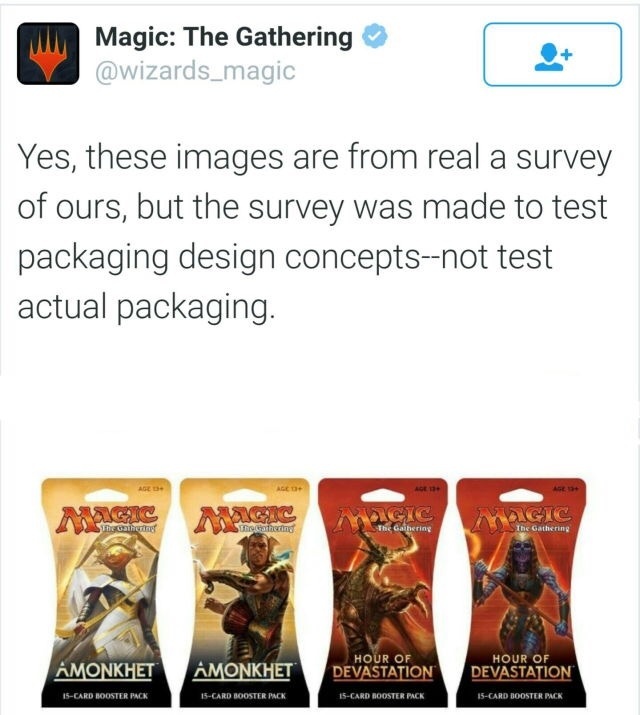 Keep in mind MaRo has stated that these are product packaging MOCKUPS and not final. “Atlazan” and “Conquest of Power” could very well be placeholders or working names for sets for all we know right now. However, that does in fact confirm that the art used on this booster packaging concept is indeed legitimately commissioned artwork for Magic: the Gathering and will likely be on a card or in some satellite product/promotion/etc. I would take people calling these “spoilers” and their speculations with a grain of salt, because MaRo himself has stated that these, at current time, are nothing more than product packaging concepts. I think the names are final. They’ve already been designed (they being the design for the set name) and if the set is coming out that soon, it’s probably pretty far into design to the point where they won’t be changing the name. The “placeholder” part is the art on the boosters. So, in that sense these are spoilers. The sets won’t be out until 2018, and they announce names and the like on Announcement Day. If the sets are the ones after Amonkhet, which seems likely, they’re out in 2017. Also, the fact that they haven’t technically announced the names is completely irrelevant. I dunno…if you look at the way “Atlazan” and “Conquest of Power” are presented versus “Ahmonket” and “Hour of Devastation” they are very bland design-wise. Those names definitely look like they were just plugged into a font generator and not actually designed. Set logos recently have been very design conscious and those don’t seem to hold up. Not saying they couldn’t be real, but if those are the final logo designs, someone is slacking. I honestly think it’s just in your imagination. Besides, if they’re far enough into design to have had art made and designed a font, the name is definitely final. Yes, to reconfirm Mr.Mayhem ‘s points, these are real spoilers because artists were commisioned for the drawings, and all the work on set design a la layout, font, motifs (like the mesoamerican glyphs in the background of the top two boosters) points to this being legit. I think they are all pretty cool, and a mesoamerican themed plane, with a possible atlantis theme mixed in could really work creatively. Although, I do have to point out, that Conquest of Power is THE dumbest name for a magic set thus far. I don’t think Atlazan will be Atlantis, I think it’ll be Aztec/Ancient Central America. The name clearly draws more from the second than the first, and the two aren’t actually related- Atlantis, if memory serves, is Greek in original and conceptually. Also, only one in four of the booster arts look aquatic at all. How is no one talking about the return of Elspeth? Because it’s not a thing that’s happened. Why would anyone have brought that up? How is it relevant to this? Given how much character designs change, it’s technically possible, but still highly unlikely based on this alone. No, it doesn’t. They’re wearing something completely different and the mask design is completely wrong for a Returned (we’ve also seen Elspeth’s mask, and that’s not even close to it). And if she was just a Returned, she couldn’t Planeswalk. It’s just some random priestess. Pretty much the only way it looks alike is if you squint from ten feet away. edit: nope, not even then. The colors are basically all there is. Because there’s nothing to support that idea. And Phyrexia rise to forever thunder in their souls. Can we get some planes in the mix that have no underlying historical/cultural theme? Except Muraganda, the dinosaur plane. We definitely want to visit that one. As long as you idiots keep buying this stuff, they’ll keep making it! From the wrath of the Pharaoh God. Against the Hour of Devastation! Team rocket blast of at the speed of light! so was this fake of did atlazan become ixalan?